The Historic Suite consists of 2 large (25m² each) rooms, a sitting room, a bedroom and a bathroom. The bed is 2m x 2m and 2 further beds can be made up in the sitting room while a baby’s bed can be set up in the bedroom. Location: in the main building, optional use of kitchen adjacent to breakfast room. Northeastern aspect. Ground-level access available, separate additional bathroom across the corridor. Our estate includes 5 comfortable rooms, 1 historic suite, 1 self-catering apartment, 2 holiday apartments, the construction trailer and the shepherd’s hut. Ecologically friendly building materials in warm and harmonious natural colours create an atmosphere of cosiness and relaxation. Our old breakfast room in the gastronomy building has been converted into a self-catering apartment with a small kitchenette and dishwasher, a round table with bench seating and a rollaway sofa bed. 2 beds (also available as a twin bed room) 2 x 2m, beautiful view down to the Schmeie River, shower, toilet and washroom. Gallery holiday apartment with a view. Our maisonette apartment has a kitchen with an oven, an eating area, a living area and a pull-out 2m x 2m sofa bed. The 1.80m x 2m double bed is located in front of the entrance to the bathroom. The bathroom has a bathtub. The second floor, which can be used as a reading and working area, is reached via a small flight of stairs. Large dormer window with fantastic views of the surrounding countryside, small seating area beside the eastern entrance. This apartment is located a little off the beaten track near our vet’s practice. It has an open-air terrace and an entrance to the swimming jetty, near the construction trailer and shepherd’s hut. Our guests’ neighbours will be a small herd of sheep (5 small Quessant sheep and Emma, a black merino sheep), along with our donkeys Heinz and Agathe. The apartment has a large bedroom and small twin-bed room. The bathroom has a bathtub. The kitchenette features a hob, oven, dishwasher, dining area and living area. The flat is certified 4-star and conforms to German Tourism Association criteria. Our holiday apartment is located in the middle of Albstadt Ebingen, in a quiet side street not far from the pedestrianised area, and it’s only a few minutes’ walk to the “Traufgänge” hiking trails. 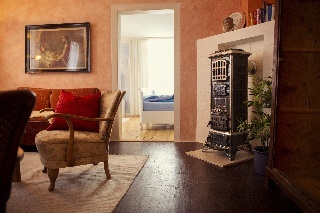 The Molch (“Newt”) holiday apartment is located at Obere Vorstadt 29 in Albstadt Ebingen. Our 2-room holiday apartment is located directly in the traffic-calmed pedestrianised zone with its “Sumpfblütler” artwork by Peter Lenk from Ludwigshafen. It has two matching rooms, each 20m² in size, along with a kitchen with a dishwasher, hob and oven, and a bathroom with a bathtub and washing machine. Both rooms have free wifi, a flat-screen TV, a 2m x 2m box-spring bed and a seating area. The slightly larger room has a Juliet balcony looking out onto the southern side of the art arcade. The apartment’s central location is ideal for exploring the nightlife of Ebingen, the largest suburb of Albstadt, and several of the Traufgänge hiking trails can be reached on foot. Located in a natural setting right next to the swimming jetty on the Schmeie, our completely renovated construction trailer, with its wood-burner and bunk beds, is roomy and cosy and sleeps 3. An overnight stay costs €29 for one person including breakfast; we make a charge of €12 for each additional overnight guest and the same amount for each additional breakfast. Guests staying in the shepherd’s hut and construction trailer have their own private bathroom and have full use of the breakfast room in the main building: the "Fischinger-Salon" is the original dining room of the "Fischinger Mühle", which was run as a hotel until World War II. "Become a shepherd or shepherdess for the day, and count sheep at night in our snug shepherd’s hut". With its cosy interior design, this original shepherd’s hut is located in a romantic setting near a natural spring beside the Schmeie, a little tributary of the Danube in the estate grounds. There is a herd of friendly sheep in a nearby field which is of course separated off from the hut. An overnight stay with a hearty breakfast costs €29 per person. Upon request, we can make you up a delightful picnic basket, and the estate restaurant is only a stone's throw away in any case. All rooms and Apartments with free Wifi, phones with own landline number and free inner German flatrate. Excluding cellphone numbers. The estate has a central room with washing machine and dryer, ironing device, shoe cleaning, a lockable bicycle storage with air pump, opportunity to repair and clean your bike. at Tel. 07434-7391337 oder 0172-9342145.